Fans around the world adore the bestselling No. 1 Ladies’ Detective Agency series and its proprietor, Precious Ramotswe, Botswana’s premier lady detective. In this charming series, Mma Ramotswe—with help from her loyal associate, Grace Makutsi—navigates her cases and her personal life with wisdom, good humor, and the occasional cup of tea. 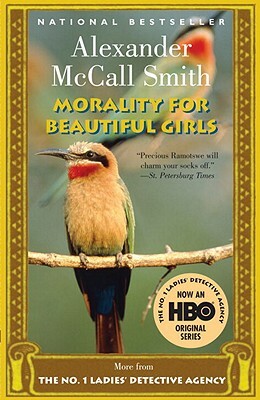 In Morality for Beautiful Girls, Precious Ramotswe, founder and owner of the only detective agency for the concerns of both ladies and others, investigates the alleged poisoning of the brother of an important “Government Man,” and the moral character of the four finalists of the Miss Beauty and Integrity Contest, the winner of which will almost certainly be a contestant for the title of Miss Botswana. Yet her business is having money problems, and when other difficulties arise at her fiancé’s Tlokweng Road Speedy Motors, she discovers the reliable Mr J.L.B. Matekoni is more complicated then he seems. ALEXANDER MCCALL SMITH is the author of the international phenomenon The No. 1 Ladies' Detective Agency series, the Isabel Dalhousie Series, the Portuguese Irregular Verbs series, the 44 Scotland Street series and the Corduroy Mansions series. He is professor emeritus of medical law at the University of Edinburgh in Scotland and has served with many national and international organizations concerned with bioethics. He was born in what is now known as Zimbabwe and was a law professor at the University of Botswana.